Food memories are funny. While I remember distinctly the very first time I tasted a fried pie, I find I can’t really recall its flavor, texture or any particulars. More, I remember my brain darn near exploding with the idea that a pie could be fried. And it was with that fuzzy recollection that I began figuring out a sweet cherry fried pie, something I dreamed about, imagined, and just had to try to make. In my mind’s eye, that hand pie was tangy and had a shatteringly crisp crust. It was showered with confectioner’s sugar and tasted like a carnival funnel cake. The filling was sweet, intense and stuffed inside so winningly that every bite included fruit. The first three or four or six iterations I produced were just terrible. It’s a miracle I kept going. In the hot oil, the dough would develop holes, and the pies were oily and unpleasant. Fresh cherries were too saucy and wet. The liquid, and then the fruit, escaped the confines of the dough pocket and seeped into the oil, spattering and sputtering. At this point, I decided to rely on an expert, and reached out to Ronni Lundy online. She wrote the lyrical, cultural cookbook, Victuals (2016), and tells the stories of her Mountain South and the foods that are central to that region. Among its many recipes I gobbled right up – think sorghum butter, sonkers (pie-cobbler mash-ups) and skillet fried chicken with milk gravy – were her quintessential fried pies. Lundy set me on the path to success when she explained that the essence of her recipe was in the filling made from dried apples, never fresh apples. I heard her, but I wasn’t ready to give up on using the summer’s first fresh cherries for my pies. So I cooked sweet cherries, reducing their juices, and added tart, dried Montmorency cherries, for a filling that was jammy and chunky and barely sweetened. Once that had been conquered, I set out to make the right dough. I combined shortening plus flour plus liquid. To achieve the tang of a funnel cake, I poured in buttermilk instead of the usual ice water. And where I had been using the common pie technique of pinching cold bits of fats into the flour, success came with room-temperature shortening that made for an emulsified, smooth dough – loose, sticky and not one bit like a pie dough. Once chilled for several hours, however, this dough was a joy to work, easy to roll out. It fries up so deliciously, you might want to make a double batch right off the bat. Because Lundy’s recipe clearly states that lard is an ingredient of some significance in the world of fried pies, I also tested my dough with lard, purchased at my local farmers market from Painted Hand Farm in Pennsylvania. I thought those pies were just a little bit flakier, and, because the lard was of such high quality, there was no porky flavor whatsoever. Making these hand pies requires no advanced skills. Roll out the dough, stamp out rounds with a wide cookie cutter or bowl. I used a scoop to fill the centers. Resist the urge to add just a little more filling. Use a fork to firmly crimp the edges so the filling won’t leak out in the skillet. Let’s talk frying. I know there is a serious kitchen condition called Fear of Frying. That’s why I developed this recipe to be shallow-fried. With a 10-inch cast iron skillet and in two cups of oil, I can fry three pies at a time. I use a thermometer to check the temperature of the oil almost obsessively, to avoid scorching the pies. Once they are formed, cooking all the pies (in four batches) takes about 12 minutes. Surprisingly easy. I know the people who experience Fear of Frying also wonder what to do with the frying oil. Here’s what: Cool it completely in the pan. Just let it sit out for a couple of hours. (Eat the pies in the meantime.) Pour the oil through a funnel into a lidded bottle or jar from your recycling, cap it tightly and discard it. The bonus: Your cast-iron pan will be beautifully seasoned. The filling can be made a few days in advance and the dough can be frozen, then defrosted overnight in the refrigerator, both of which make these pies ready-in-no-time, crowd-pleasing, memory-making treats. Bring them to your next cookout. Serve these treats warm.You’ll have more success with this recipe with an instant-read thermometer to monitor the temperature of the oil. You’ll need a 4-inch-round cutter, or use a small plate as a template. MAKE AHEAD: The dough needs to be refrigerated at least 4 hours, and up to 2 days in advance, or can be frozen for up to a month. Defrost overnight in the refrigerator. The filling can be refrigerated up to 1 week in advance. The pies are best when served right away. Ingredients:For the dough:3 cups flour, plus more as needed½ cup lard or vegetable shortening, at room temperature3 tablespoons granulated sugar½ teaspoon kosher salt1 cup buttermilk, at room temperatureFor the filling2 cups pitted and halved sweet cherries1 cup dried, tart cherries, chopped¼ cup granulated sugar2 teaspoons fresh lemon juiceFor assembly:2 to 3 cups canola or another neutrally flavored oilConfectioners’ sugar, for dustingMethod:For the dough: Lay a large piece of plastic wrap on the counter and lightly flour it. Combine the 3 cups of flour, the lard or shortening, granulated sugar and salt in a food processor; pulse about 15 times, until just combined. Pour in the buttermilk; process to form a smooth, sticky dough. Scrape it out onto the floured plastic wrap, then form the dough into a block that’s about 6 inches by 4 inches. Wrap and refrigerate for at least 4 hours, and up to 2 days. For the filling: Use a fork or potato masher to mash together the sweet cherries, dried cherries, granulated sugar and lemon juice in a medium saucepan. Bring to a boil over high heat, stirring all the time; cook at a boil for about 10 minutes, until thick and jammy, stirring often to avoid scorching. Let cool completely. 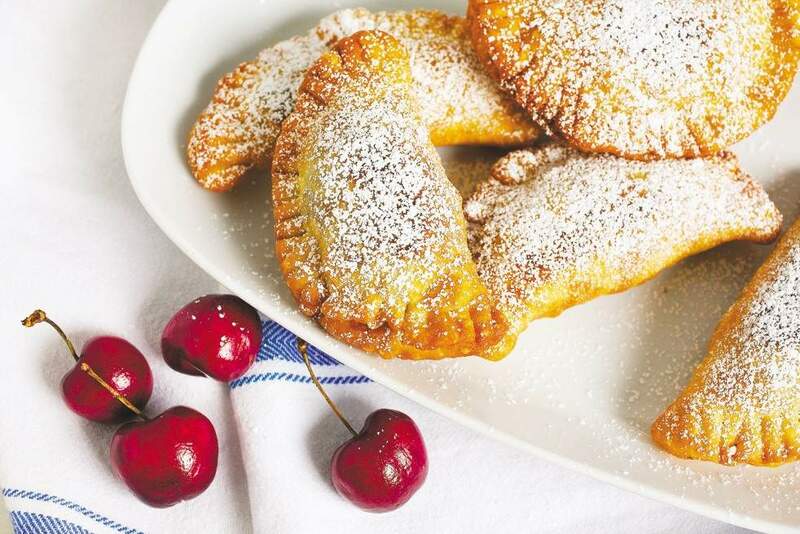 To assemble the fried pies, bring the dough to room temperature for 30 minutes. Line a rimmed baking sheet with paper towels and set a wire cooling rack inside. Lightly flour the countertop. Unwrap the dough and roll out the dough there to rectangle about 16 inches by 12 inches, and about ¼-inch thick. Stamp out 12 four-inch rounds, keeping the cuts close together. There should be little waste. Place 2 tablespoons of the filling in the center of each circle. Lift the round of dough carefully and keep the filling securely in the center. Press the edges together with your thumb and forefinger, pushing out any air bubbles, then place the pie back down on the floured countertop and enthusiastically crimp the edge with a fork. Repeat until all the pies have been formed, filled, pinched and crimped. Heat about 2 inches of oil to 350 degrees in a straight-sided, heavy skillet (such as a 10-inch cast-iron pan). Slide about three pies at a time into the hot oil. Do not crowd. The pies will lower the temperature of the oil in the pan, so adjust the heat accordingly and watch that it doesn’t get too hot. It will take a total of 3 minutes to cook the pies. Watch as their crusts blister and crackle, turning them every 30 seconds to avoid scorching. Use tongs, a spider or a slotted spoon to keep the pies turning. Once the pies are golden brown, transfer them to the rack to drain. Repeat to cook all the pies. Let them cool for a few minutes, then dust generously with confectioner’s sugar and serve. The filling will be very hot, so be careful. Source: From columnist and cookbook author Cathy Barrow.